Haagse school, Larense school, Amsterdam school, Bergense school and Leidse School. And we give you every guarantee you desire. So when you are in Amsterdam, just visit us. We are, by far, the Gallery in Holland with the lowest prices, as we buy, sell, clean and restaure all our painting as a hobby, that became too big. Besides we specialize in small or unknown masters. We give full quaranty on the name of the painter who made the painting. We sell Winterlandscape and Summers, Lots of Beaches, Flowerstillives, Interiors, Marines, and Paintings of Sheep, Cows, and Birds. Every sort of Classical, realistic painting. Always Oilpaintings, on wood or on canvas. We are located in the Centre of Amsterdam, in a beautifull Canalhouse, 5 minutes walking from the Rijksmuseum and The Van Gogh museum, at the Corner with Spiegelstraat, the famous Amsterdam Art street. Our adres is KEIZERSGRACHT 531 in Amsterdam. In the neighbourhoud you will find lots of antique shops, beautifull museums, the flowermarket and a fine shopping area. there is absolutely no need to buy any painting. We are happy, if you are interested in our collection. For free information on paintings, you can also come visit or e-mail us. We have made a complete databank with auctionprices, monographies, signatures, photos and other things to know about dutch paintings from 1989 till now. In this databank we stored 4000 names of Dutch painters together with more then 70000 prices. So in this way you and we can control the prices of Dutch paintings. If you need a price-estimate of any paintings, or information about Dutch painters, just write us an e-mail with your questions and we will contact you. And there is no cost at all. 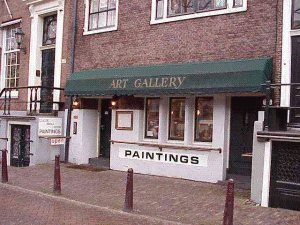 We made a small selection of photos and prices from our dutch paintings and gallery. Dutch paintings are famous all over the world. From the 17th century masters like Rembrandt, Vermeer, Hals, Steen and others, the 19th century romantic painters like Koekkoek, Schelfhout, Leickert and impressionists like Maris, Israels, Arntzenius and others, till the Dutch members of the 20th century COBRA group like Appel, Lucebert and Corneille. Dutch paintings have been appreciated all over this world. In Holland, there were many “Schools”of painting. Important were the Haagse school, Larense school, Bergense school, and even the painters of the 19th century Romantic school and the Impressionists. If you want more specific, free information just send us an e-mail with your questions.